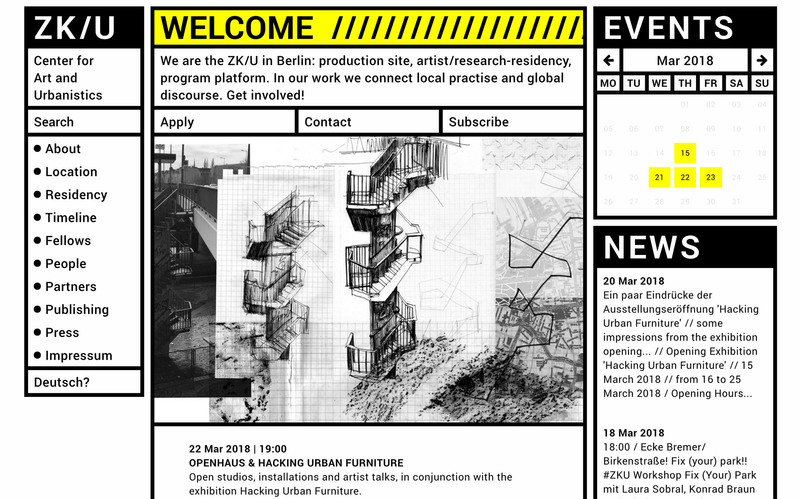 A: The brutalist web-design of ZK/U – Zentrum für Kunst and Urbanistik in Berlin serves as the centrepiece of the venue’s redesigned identity, which is all „brutalist“ in itself. This aesthetic choice perfectly illustrates the center’s values and overall approach (according to your definition of web-brutalism as „ruggedness and lack of concern to look comfortable or easy“), since a lot of the work there has this certain self-made charm of creative communities with a proper dose of bottum-up anti-establishment thinking. This is definitely to be seen on site in the former railway depot in Berlin-Moabit, which is naturally often reminiscent of an industrial/urban construction site. The intention was to reflect just that in their visual appearance, by echoing the ever-changing and honest flair of building structures and their minimalist warning signs – a logical decision for a place called „Center for Art and Urbanistics“ (especially if „brutalist“ design choices evoke a certain hint of avantgarde thinking too).